Because a lot of my favorite brands of almond milk contained this additive I decided to learn how to make my own at home. I mean, how hard could it be? Turns out, almond milk is extremely easy to make and now I make it all the time. I feel so much better drinking my own homemade version because I know exactly what is going into it and exactly what stays out. Take raw almonds and put them in a bowl. Cover them with water and place on your counter (or fridge) to soak for at least 12 hrs. 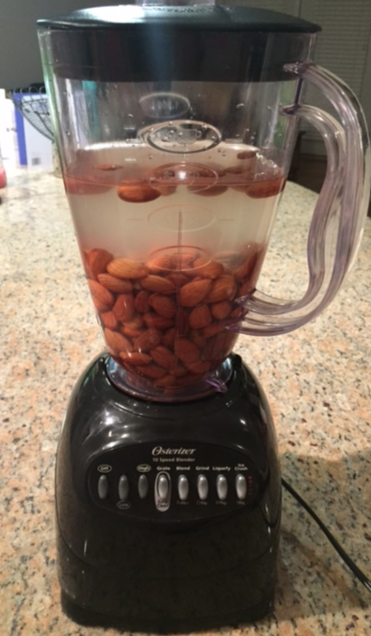 Next, drain and rinse the almonds and pour into blender. Pour mix into nut milk bag and drain milk into a bowl. You really just want to separate the pulp of the almonds from the milk and once that is done you can keep the leftover almond meal for baking! Once your milk is separated and in a jar you can sweeten it however you please! Tip: Look up natural sweet drops on amazon and browse through the flavors. Just a few drops of these goes a long way and they have great flavors available. Click here to check them out!